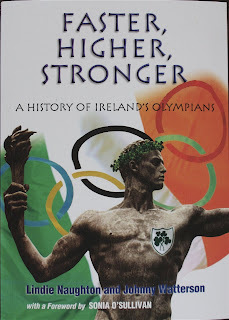 Just published in time for the Beijing Olympics is "Faster, Higher, Stronger - A History of Ireland's Olympians". Among other things, this book, written by Lindie Naughton and Johnny Watterson, includes an A to Z of every person of Irish extraction ever to compete at an Olympic Games. This website is designed to update information, fill in the gaps and add a few more stories we couldn't fit in the book. We hope it will keep you entertained - and not just during the frenzied fortnight in Beijing! INEVITABLY, the gremlins did a bit of damage to our book. Corrections and amendments will appear here. *Jim Hogan started the 10,000m as well as the marathon at the 1964 Olympics in Tokyo; he failed to finish in both. * On page 264, and 265, we have a list of the 1948 football team without first names, for which we hunted high and low without success. 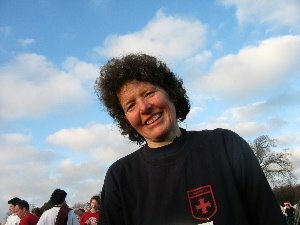 We now know two: Lt Patsy McGonagle (any relation to the Irish athletics manager?) and Emmet McLoughlin; both Donegal men. This is all the info I have. Would love more on the 1948 team. Goalkeeper Paddy Reilly (Athlone Town); defenders Herbert Kerr (Bohemians), Jack McCarthy (Bohemians), Thomas Murphy (St James's Gate); midfielders John Thomas (Bohemians), John Joe Dykes (capt) (Athlone Town), Tommy Muldoon (Athlone Town), Christy Robinson (Bohemians), Ernest McKay (St James's Gate); forwards Charlie Dowdall (St James's Gate), Paddy Duncan (St James's Gate), Frank Ghent (Athlone Town), Johnny Murray (Bohemians), Michael Farrell (St James's Gate), Joe Kendrick (Brooklyn FC), Dinny Hannon (Athlone Town); reserves John Lea (Shelbourne), Frank Heaney (St James's Gate), Bob Cowzer (Shelbourne), Ernie Crawford (Bohemians), Th Aungier, J Healy. 1948: played one prelim match against Netherlands and lost 1-2. W Barry, W Brennan, J Cleary, F Glennon, P Kavanagh, P Lawlor, R Smith, Lt Patsy McGonagle, P McDonald, Emmet McLoughlin, W O’Grady, B O’Kelly, W Richardson.